Retired? – God Ain’t Through With You Yet!! A couple days ago, I had the wonderful privilege to go and minister to some folks at a local nursing center. It was an amazing experience. It has been years since I had been involved in this kind of ministry. I met a man who was previously in ministry, and he shared with me about Jesus whom he called his faithful companion. He went on to tell me that even though he was in this nursing home he was still going to preach the Bible. He host weekly Bible studies in the dinning hall, and does what he can to pray over the sick and hurting. I was amazed at this man’s heart for God. It inspired and encouraged me. It also got me to thinking about many of God’s men and women who are so called “retired” sitting on the sidelines enjoying their lives while there are people all around them suffering. All I have to say about that is “God ain’t through with you yet! !” He has things in store for your life that you can’t even begin to imagine if you will just be faithful and serve. Don’t waste your life get out there and share the good news of Jesus. There are an innumerable ways to study your Bible, and some ways work better for some than others; however it is important for us to have a basic understanding of how to study our Bibles so that we might have a greater grasp of knowledge when it comes to applying scripture. I highly recommend Rick Warren’s book – “Personal Bible Study Methods”, for 12 applicable ways to study the Bible on Your own. Such methods include chapter, character, thematic, biographical, topical, word, book background, book survey, chapter analysis, and verse-by-verse studies. I will be presenting a basic Bible study that can be applied by even the newest Christian. It is a compilation of methods over the years that have really worked for me, and I am confident that they will work for you. This method is a Book Study that encompasses verse-by-verse and chapter by chapter. Before we get started with “How to Study your Bible” it is important that you have a basic understanding of the overview of the Bible. The Bible is divided into two major categories consisting of the Old and New Testament. The next nine books are General Epistles. 1. Getting Started – There are many ways to study your Bible, however this is a simple method that will help you get started. This particular method is great for beginners; however, it can be geared toward any level of study. As you become more comfortable with Bible study, you will begin to develop your own techniques and discover favorite resources that will make your Bible study very personal and meaningful. The first step to accomplishing anything is to first acknowledge that you are going to begin this journey called Bible Study. You need to determine in your heart that you will accomplish the task at hand. Consider telling others what you are about to study, and challenge them to ask questions along the way. You need to find a prayer partner that will help hold you accountable to your studies. You might consider doing a Bible Study with a partner in order to build confidence and your ability to Study the Bible with diligence. 2. Determine which Bible – Find a Bible that is Biblically accurate and user friendly. Use a Bible with easy to read print, large margins, and preferably one with footnotes and references. The English Standard Version, New American Standard Version, and the New King James Version are all good translations. Use the same Bible throughout each book study. This will consolidate any and all notes and thoughts you will have obtained throughout your study. If you decided to switch Bibles in the middle of a study, be sure to transfer all of your notes to guarantee the preservation of your research. This does not mean you can’t read from other Bibles to compare translations; however it simply means to designate one as your primary Bible for studying. 3. 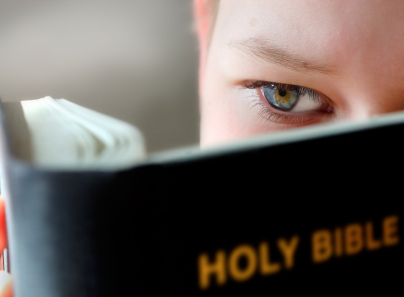 Choose a Book to Study – In this method you will study an entire book of the Bible. If you’ve never done this before, start with a small book, preferably from the New Testament. The book of James, Titus, 1 Peter, or 1 John are all good choices for first-timers. Plan to spend 3-4 weeks studying the book you have chosen. Once you feel more comfortable with some of the smaller books move on to the books of the Gospel, Matthew, Mark, Luke, and John. Also, consider studying Genesis, Job, and Revelation. 4. Start with Prayer – “I just don’t understand it!” is one of the most common excuses for not studying the Bible, and this is also the reason we have so many immature Christians. We understand not, because we ask not. The Bible tells us that the Word of God is foolishness to those who don’t believe, and to those who are carnally minded. So before you start each study session, begin by praying and asking God to forgive you of any un-confessed sin and open your heart and mind to spiritual understanding. The Bible says in 2 Timothy 3:16,17 “All Scripture is breathed out by God and profitable for teaching, for reproof, for correction, and for training in righteousness, that the man of God may be competent (complete), equipped for every good work.” (ESV) So, as you pray, realize that the words you are studying are inspired by God, and are profitable in every aspect of your life. 5. Read the Entire Book – Next you’ll spend some time, perhaps several days, reading through the entire book. Read it verse-by-verse and chapter-by-chapter. Do this more than once. As you read, look for themes that may be woven into the chapters. Sometimes you’ll detect a general message in the book. For example, in the book of James an obvious theme is “Persevering through Trials.” Take notes on the ideas that jump out at you. 6. Dig Deeper – Now you will start to slow down and read the book verse by verse, breaking down the text, looking for deeper understanding. This is where you will begin to mark in your Bible, notes, applications, and references. You will also use symbols, highlight, and underline significant phrases and key words. Key words are words that stand out or tend to be repeated. Key phrases are usually life applicable, or illustrate the main thought of the passage. There are many ways of marking your Bible such as using as color coded system with highlighters, or a symbol chart. I use a simple underlining method that works best for me, but feel free to use other methods. As you can see I parenthesized the word Job so that I knew who this passage was talking about. I also underlined blameless and upright because they describe Job. I then parenthesized “one who feared God and turned away from evil”, because it illustrates why Job was blameless and upright. This is a life application statement, if I fear God, and turn away from evil I can become blameless and upright. I then underlined feast, eat, and drink, and then I made a note to myself that this was more like a * drinking party. I also circled the word “consecrate” because it stood out to me. This word could have many possible meanings, and correlations to this passage. This would be a word that I would do a word study on, and check references. I then put cross symbols around the second to last statement, because it references LORD. Finally, I underlined the last verse because it makes a crucial statement. The biggest mistake many people make when it comes to marking their Bibles is that they mark a single passage so much that it becomes confusing, irrelevant, or hard to read. The purpose of marking your Bible is so that certain parts will stand out, and will be easy to reference back to. When you underline everything it defeats the whole purpose. 7. Equip Yourself – There’s no limit to the wealth of understanding and growth that will come from your time spent in God’s Word. Once you have established a basic understanding of the passage, as well as the key phrases, words, and principles then you will want to begin using Bible study tools in order to develop greater understanding. The major Bible study tools consist of a commentary, lexicon, Bible dictionary, and Concordance of the Bible. You might also consider using a Bible Encyclopedia. 8. Apply It – Now it’s time to apply it to your life. Don’t just study God’s Word for the sake of knowledge for that will lead to self-righteousness; however be sure to put the Word into practice in your life. Jesus said in Luke 11:28, “But even more blessed are all who hear the word of God and put it into practice.” (NLT) When you apply the Word of God into your life people will begin to see Christ in you. Your life may be the only Gospel that some people might read. Be sure to also begin to apply Bible study into your prayer life. This could consist of a favorite passage, a psalm, or even just flipping through the pages. 9. Map it Out – Once you’ve finished your first book, choose another one and follow the same steps. Go ahead and map out a timeline of which books you plan to study over the next year. Make sure you be consistent in your study time, and set a comfortable steady pace. Once you become more confident in your skill begin to incorporate longer books. Once the practice of Bible study becomes habitual begin to mix up your timeline with books consisting of the Old and New Testament, and Gospels. You will want to spend much more time digging into the Old Testament and some of the longer books of the Bible. Don’t forget to set goals for yourself, and reward yourself when you accomplish those goals. (Example: New Bible, Bible Study Tool or resource, or just some good old fashioned ice-cream). 10. Pass it On – Now that you have grown in your Bible study skills, and you have completed your first book, it is now time to pass it on to others. Share with a friend, family, Bible class, or even start a Bible class. When you begin to teach others, don’t expect to have all the answers. If you are unsure of an answer inform the person that you will have to get back with them with an answer. Seek counsel from other Biblical scholars, such as, teachers, preachers, and elders. Never give questionable answers, and be sure to always confirm what you are teaching to prevent the Word of God from being taken out of context. Daniel along with his 3 friends could of easily gone along with the crowd, but they had set in their hearts that they didn’t just want to stand with the crowd, but they wanted to soar/excel above the rest. We can learn a lot from Daniels example when it comes to Excelling in School. When you seek counsel from such individuals, God will see your desire to change, and will be likely to work in the hearts of that/those individual(s) to have compassion upon you. Some may show apprehension (v.10), however when you prove faithful you will have gained their approval and respect. What is one thing you can do in your life that is going to make you more confident in your ability to stand against the crowd? Name 2-4 core people you could trust in to be your friend and help support you in your decision to excel in your life? Name 1 teacher/mentor/counselor/advisor who would be able to hold you accountable at school? What 1-2 areas in your life would you like to see most excel over the next school year? What are some ways you can challenge your friends/mentors to hold you accountable? What are some ways that you can stay committed to the cause? Nelson’s Complete Book of Maps and Charts Third Edition which includes full color reproducible maps and charts from the Old and New Testaments is an invaluable study tool that brings scripture to life. Each of the 66 books of the Bible are dynamically expounded upon with rich detail. This is like an Old and New Testament Survey all in one. Each chapter of the books of the Bible are given and introduction followed by the author, date, theme, and outline of the book. Each chapter is jam-packed with biblical knowledge that is sure to enhance the development of study habits and lesson/sermon preparation. Pastors, ministers, professors, small group leaders, Sunday school teachers, and individual Bible students will greatly benefit from the insightful knowledge and user-friendly structure of this book. All maps and chart’s are also available for free download with the purchase of this book. Use the charts and maps in your sermon/teaching illustrations. This book is a visual overview of the whole Bible at your fingertips! I would highly recommend this book. It took me some time to read the whole thing, but it was completely worth it. Very seldom do I give a book five stars, but after reading it how can I not. After receiving it, I thought to myself…”this will just be another book on my shelves that collects dust”, however I use it on a regular basis. It still sets on a shelf from time to time, but it has the privilege of being placed next to my favorite Bibles and sermon preparation tools. I am still intrigued at how in each chapter that discusses every book of the Bible they present a clear presentation of how they each point back to Christ. I love that aspect about this book, it always points back to Christ. I can’t say enough good stuff about this book, but like I said before I highly recommend it, five-star, get yours today. As we continue our journey in becoming spiritually F.I.T. we will look at I – Intentional Proclaiming. Often times Christians get this idea in their head that they will eventually or someday start reading their Bible and living a Christ-like lifestyle which is so far from the truth. That is like telling yourself that one day you’re going to go on a diet and yet you never change your grocery food list or restaurant selection. It is impossible to eat healthy when all we do is consume McDouble quarter pounders, and the same goes for our spiritual health. The Bible says in Romans 3:11,21 “There is none who understands; There is none who seeks after God” and apart from the righteousness of God nothing can be revealed. Because God is righteous He desires to reveal great things unto us as stated in Philippians 2:13 “It is God who works in you both to will and to do for His good pleasure.” Unfortunately because of our poor diet consisting of junk food and garbage we leave no room for any healthy consumption. So let us define the two words. So in order to Intentionally Proclaim we must first be prepared or studied prior to the proclamation or sharing of God’s Word. When you have indulged into the fruit and meat of God’s Word then the proclaiming will just be an outpouring of energy resulting from healthy consumption. For example when you eat healthy foods you find yourself having more energy than you ever had. Activity just pours out of you, unlike when you over-eat fatty foods all you want to do is lay around and sleep. So let us “Grasp” how we can become intentional stewards of Scripture so that we might intentionally proclaim God’s Word. To start off, trace your hand on a sheet of paper and title it: “Six Ways To Get A “Grasp” On Your Bible.” Label these fingers. The palm is the word “APPLY”. These are the six ways that you can get a grasp on God’s word. Hear, Read, Study, Memorize, Meditate, Apply. When you get a grasp on God’s word you want to have more than just the little finger. Most Christians, the only way they take the Bible into their life is they hear it. They don’t read it or study it. They come to church. They just hear it. Hold your Bible with just that little finger. It’s not much of a grasp. See how easy it is for it to be pulled from your grasp? On the other hand if you are holding it with all 6 then you will be studied, prepared, and capable of Intentionally Proclaiming. It will pour out of your life, and out from your lips. If you have been following us in this series of Spiritual exercise you will have now understood the purpose in being spiritually F.I.T. and you will have taken the first two steps to having a healthier walk with the Lord: Fervent Prayer and Intentional Proclaiming. Check back next week as we work out with T – Trained Living, and we continue our study in Philippians. I originally decided to get the Word of Promise – Next Generation New Testament to have something that I could just listen to in the background as I went through my day, however I soon realized that it could be used in many different aspects from personal Spiritual growth, to Bible studies / small groups, and to ministry in general. I have never been a big fan of audio Bibles, but this one along with the all-star cast really bring the Word of God to life, especially in the minds of teenagers. Unfortunately, because of the format of these MP3 CDs they do not play on all CD players. There has been times that I would like to have listened to them in my vehicle, but was unable to because of the incompatibility with my old-school CD player. Thomas Nelson does offer the CD unabridged version which comes on 20 CDs for just a little over the MP3 CD price. I should also mention that the Word of Promise – Next Generation New Testament is tailored for teenagers in mind. Some adults might find these audio CDs to be a little on the youthful side. I personally am not the biggest fan of this translation, but I do feel that students will be able to comprehend the New Testament in great ways because of it. I would recommend the Word of Promise (NKJV) for those who prefer a little more traditional translation / adult narration. Over all this would be a great asset to add to your collection or to give to the teenager in your family / youth group.